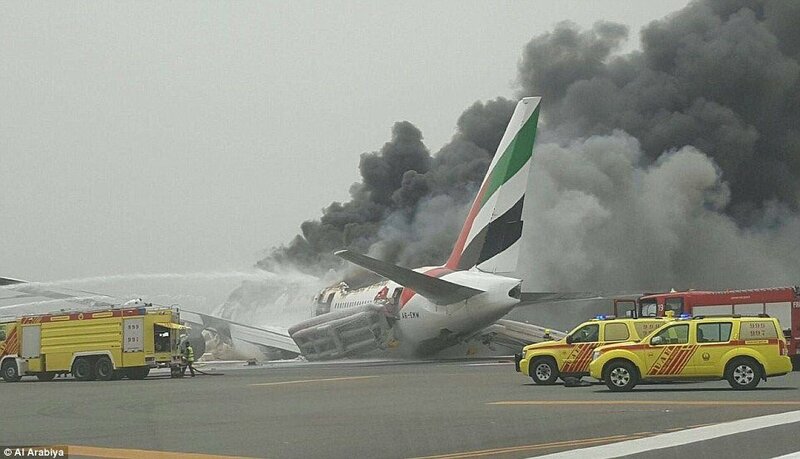 A firefighter died when an Emirates airline flight crash-landed at Dubai International Airport on Wednesday, but all 300 passengers and crew were evacuated safely from the aircraft, authorities said. Dramatic pictures and video posted on social media, purportedly of the crash-landing, showed a thick plume of black smoke rising from the top of a burning aircraft on a runway. Emirates' Chairman & Chief Executive Sheikh Ahmed Bin Saeed Al Maktoum told a new conference on Wednesday evening that a firefighter at Dubai International died in the operation to douse the flames that engulfed the plane. All 282 passengers and 18 crew escaped the aircraft safely, though four passengers suffered minor injuries, Al Maktoum said, adding that it was too early to say what caused the accident. However, he ruled out "anything in terms of a security issue at this stage." The pilots and crew were the last to abandon the aircraft, Al Maktoum said, praising the "maximum level of professionalism they have demonstrated." Dubai airport, which was closed following the accident and all departures and arrivals halted, re-opened at 6:30 pm local time (14:30 GMT), according to Dubai Airports. Sean Maffett, an aviation analyst and former pilot, told Al Jazeera that it was extraordinary there were no casualties reported among the passengers and crew. "What we do know is that the aircraft slid along the runway without its undercarriage being down. We can see from the videos that one of the engines broke off, and the sliding along the runway on the bottom of the fuselage and the wings caused this very big fire," Maffett said. "What I think is a really positive thing to come out of this, is that the cabin crew, and of course helped by the flight crew, managed to get all of those 300 people off that aeroplane apparently without anybody being killed," he said. "That is quite an extraordinary and quite a well done effort by the crew on the aircraft." Flight EK521 was arriving in Dubai from Thiruvananthapuram in Kerala, India, Emirates said on Twitter. The 300 passengers and crew included 226 Indians, 24 Britons and 11 Emirati nationals. One passenger was quoted by local Indian media as saying the flight came down suddenly while landing and bounced upwards, with some passengers suffering minor injuries before escaping via the emergency escape chute, according to the Deutsche Presse-Agentur news agency. The escaping passengers were then taken to a corner of the tarmac where some were being treated for their injuries, Kerala news website Manorama Online quoted the passenger as telling a local television channel over the telephone. Alex Macheras, a London-based aviation expert, told Al Jazeera that the event was unusual based on flight tracking information. "Emirates operate an entirely longhaul fleet ... this aircraft was coming in on a steady and normal textbook approach to the airport, which is very congested. Looking at these shocking photos, the landing gear is nowhere to be seen."